The Delrosso limestone fireplace is a stunning fireplace that is produced with only the highest quality materials. The perfect blend of stunning materials and lighting makes this fireplace a great addition to and home. The solid limestone in the Delrosso is obtained from Portugal. The fireplace also features an inlay crafted from travertine marble. Travertine marble is noted for its use by Michelangelo for the external ribs of the dome of St. Peter's Basilica. This provides the Delrosso limestone fireplace with a beautiful feature and a noted historical footnote for conversation. There is a slipped back panel on the fireplace to provide utility and additional accents. Each Delrosso fireplace also comes with a twin stepped hearth. Perhaps one of the finest features of the fireplace can be found in the twin downlights. These lights come as a standard feature on each Delrosso limestone fireplace, and the lights allow the fireplace to be a source of beauty in your home throughout the year. 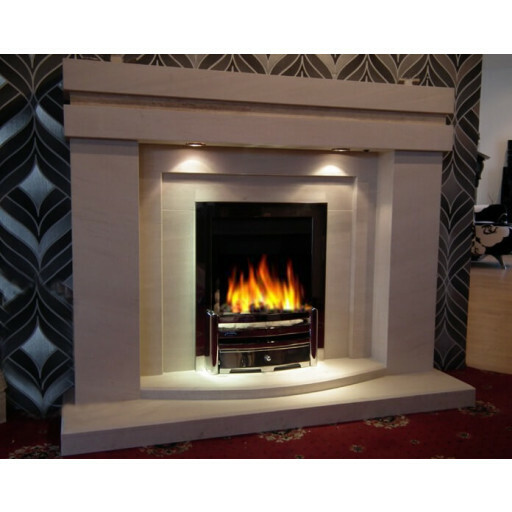 The Delrosso limestone fireplace can provide a stunning feature in any area of your home, this fireplace is sure to become a quality focal point in any room.